Badung regency government, as the district which hosts the APEC Summit, have prepared accommodation for the deledasi from various countries, as many as 21 hotels. 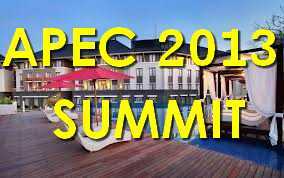 The hotel will be occupied by the 21 participants of the APEC heads of state and their delegations. The plan with the head of each state delegation would be placed in the same hotel. One hotel for one country. The hotel was spread across three locations, in Nusa Dua, Tanjung Benoa and Jimbaran, which is located near the APEC venue. APEC 2013 Summit scheduled to be held in Nusa Dua area. Not yet known name that will be used to stay the APEC participants. It was suppressed by the organizing committee. Possible to maintain the security of the guests who will stay. Bali police have been preparing personnel to secure the APEC 2013 Summit. Police used security standards Bali remains appropriate security procedures are heads of state who have often come to Bali.